In the spring of 2013, at the invitation of Waseda International School’s Paramita Basu, I embarked upon my first author visit ever. My presentation was split into two sessions. The first session was attended by a bouncy contingency of thirty-eight preschoolers. The second session was attended by the elementary students ranging in ages from 6 to 12. Besides packing my MacBook with Keynote presentation, my iPad with digital book loaded, I also brought along… (to help me weather all 45 minutes with the preschool set)… a sack full of puppets for the youngest students to play with and try out. Waseda International School is located in downtown Tokyo, close to Shinjuku. I was met at Takadanobaba station and we walked uphill to the school where we got set up in the lively and welcoming preschool room. Somehow, all of the wiggly three to five year olds were gathered onto a corner rug where they sang a song about the parts of a flower with their teacher who had a beautiful voice. The children got to meet Baaabara, the library lamb, who enjoyed meeting all of the children even though she didn’t manage to learn all thirty-eight names. Blame it on those very fuzzy, but adorable ears. While Baaabara took a little nap in the puppet bag, the WIS preschoolers enjoyed “Princess Ramona, Beloved of Beasts,” which was projected from the iPad onto the large screen at the front of the room. 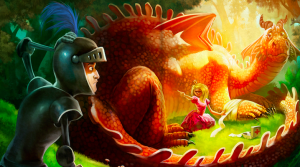 As soon as the children realized that there was a dragon hidden in many of the illustrations, as soon as the digital page was turned, there was no continuing with the story until the dragon was found. The ability to zoom in on the details of the illustrations helped to hone in on the hidden dragon, much to the delight of the kids. The older group enjoyed a Keynote presentation about the importance of reading… and the importance of knowing when and where to read. Reading with friends, reading with dogs, reading in trees… all good. Reading while driving, reading while pig wrestling, reading with a crocodile… not so good. The older students also got to see the entire “Princess Ramona” book and enjoyed the rhyming text of the story and the built-in dictionary. 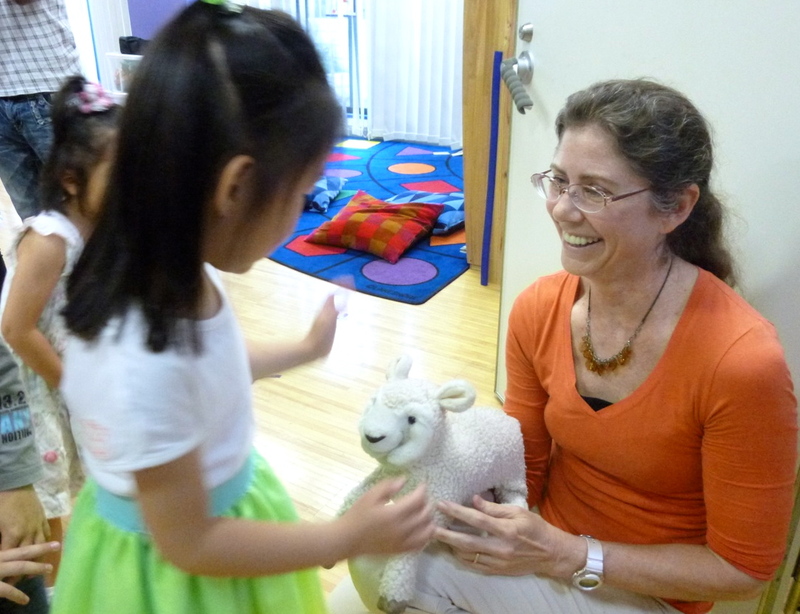 We stopped at various words to study the meaning which was especially helpful for the second-language learners. A “lummox,” we discovered, is a clumsy, stupid person. They were happy to see that the lummox knight turns out to be a helpful and reasonable sort in the end. 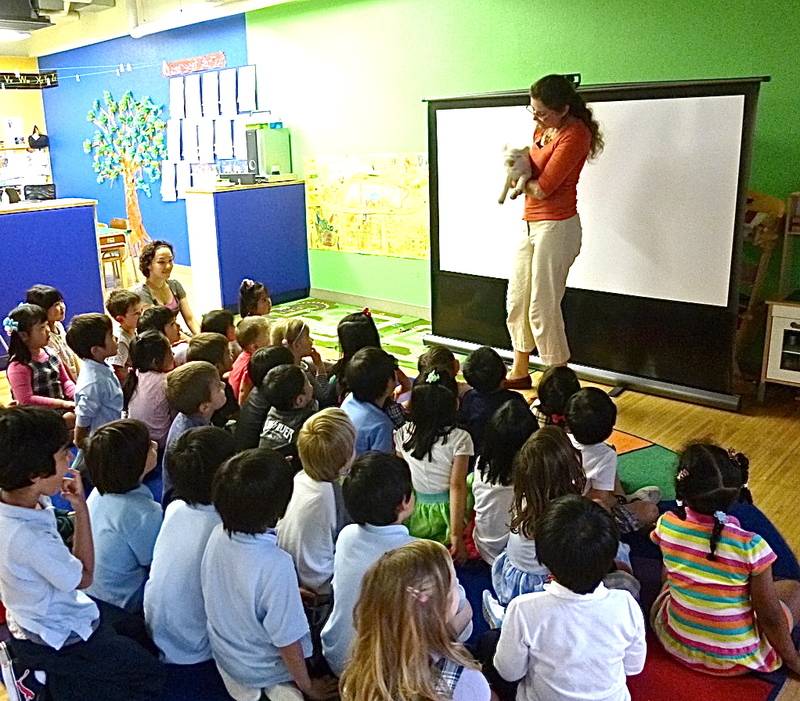 I was honored to be invited to Waseda International School to present “Ramona” to their delightful students. Special thanks to Paramita for the invitation and for arranging all of the many details! After such a positive experience and enthusiastic student response, I look forward to my next author visit.